If you’re in charge of the office christmas party ideas or just a cozy gathering of close friends for holiday cheer, we’ve put together some helpful hints to make it go smoothly. Invitations: Custom printed holiday party invitations get your guests excited! Does your invitation scream “I can’t miss this party, it sounds fabulous!” or did you send out a letter sheet that reads like a grocery list of boring statistics that immediately got relegated to the holiday pile referred to “maybe we’ll think about it unless a better invitation comes along.” The party invitation is a sneak preview for your guests to see how great your holiday party will be and they won’t want to miss the event of the season. If you’re in charge of ordering the holiday party invitations, pre-order them as early as possible to reserve the invitation design you can’t live without. When you have all the party details finalized, you can then complete your invitation order by emailing the final information to be printed on your invitations. You’ll want to send out Christmas party invitations at least three weeks prior to the party date. Business and corporate invitations are ordered and mailed as early as September to ensure a great turnout. Have at least one week between the RSVP date and the date of the holiday party. Your RSVP’s can be formal cards that are mailed back to you, a phone number to reply to or the less formal, regrets only phone number for invitees that cannot attend. 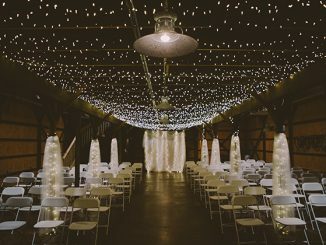 Don’t select the “regrets only” option if you need to have a final count on “who’s coming” for the caterer or your own planning of how much you’ll need of paper goods, booze, tables and chairs, party favors and so on. When in doubt, you can also call or email your guests if they haven’t responded by your rsvp date. Guest List: Decide on a guest list for your holiday party, then check the calendar and set a date and time that is convenient for all your guests and/or co-workers. Planning the office Christmas party only to find out the boss will be in Tahiti on that date would be a disaster! Make sure there are no conflicting Christmas parties or holiday events planned or any scheduled business commitments that conflict. If your party won’t be a success without “The Smiths” in attendance, make sure they have your party date open before you commit to your chosen date. Date: If there’s lots of competition for your chosen party date or lots of parties in your social circle, send out your invitations as early as September – or if that’s just too early for you, send a Save the Date card so people will be anticipating your formal invitation details after they’ve added your party to their calendars. If the location of the party is critical for its success, or certain guests just have to be there or the party will bomb, make sure they are available BEFORE you commit to your chosen party date. Location: Choose the party location. If the holiday party will not be held at the office or your home, reserve the location as soon as possible, if required. Double check and verify the date is set with your party location, caterer, DJ, photographer or any other personnel that are critical to the success of your holiday event. Theme: Select the theme of your holiday party. What food and beverages will be served, decorations, music and activities (gifts, games, dancing, entertainment, Christmas carols, recognition awards, white elephant gifts, etc.)? You might have a favorite Christmas movie or song and you can decorate and plan around it with food, costumes, lighting and music. Pick a color, such as Christmas red, and buy all your decorations in this color – you can even ask your guests to dress in your party color. And don’t forget the Christmas Tree! Have a tree-trimming party as your theme and ask guests to help or to bring an ornament. If you’re planning a gift exchange, make sure you set a dollar limit and include the information on your invitation. You might choose to support your local food bank and ask guests to bring non-perishible items for donation. This time of year, charities also have families you can sponsor. Pick a family and include their details and the items on their wish list with your invitation. Entertainment: When all the guests arrive, what do you do with them? Mix and mingle is great for people that know each other or if you are having an open house for guests to just drop in. Some ideas for entertainment are: DJ, Band, Caricaturist, Magician, Balloon Magic, Clowns, Jugglers, Santa Claus, Toasts and Roasts, Christmas videos to play on your big screen, or party games. Partyware: Are you going to use your best silver and china or festive plastic or holiday plates, napkins and eating utensils? 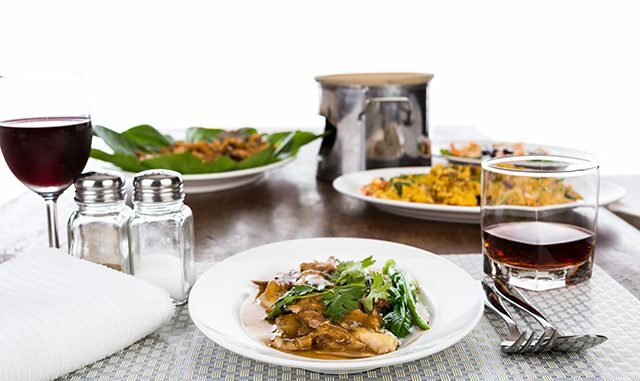 Are you serving hot food, cold food, hot drinks, alcohol and wine – what type of glassware do you need? Do you need serving bowls and platters? Do you need centerpieces? A sign for the front “The Party’s Here!”? Don’t wait too long to go shopping as the best choices and the larger quantities will be available early in the season or may even be able to be special ordered for you. 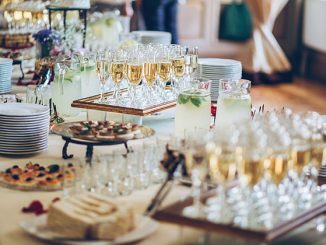 Food: Set out a simple buffet, such as cheese and crackers, hot soup and small sandwiches, serve your favorite wines and a few fabulous desserts and you’re guaranteed success. Or, if you’re a dessert-aholic, avoid the dinner hassle altogether and have a dessert and drinks party. Make the desserts ahead of time, ask your guests to bring their favorite dessert (along with copies of their recipes to share) and enjoy the decadent treat. Also popular in today’s economy is sharing the food responsibilities. The host supplies the main dish (and the location) and guests bring their favorite holiday recipe of hors d’oeuvres, salads, side dishes or desserts. Keep your focus on having a great time, not on breaking the bank with elaborate offerings. 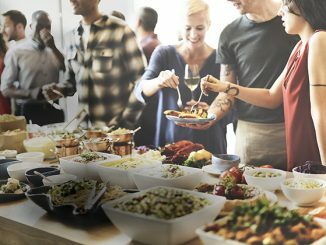 The focus is on getting together with your guests, not on the food. Dress Code: What is the dress code? Strict black-tie, black-tie optional, festive attire, casual holiday attire, dress to impress, or anything but blue jeans. Sometimes the location of your holiday event will help determine dress code, but be specific on your invitations so your guests will arrive appropriately attired. Alcohol: If alcohol is served, make sure designated drivers or other transportation is arranged (shuttles, taxies) or specify that you will provide overnight accommodations. If rooms are being reserved, please indicate how your guests can obtain one, what cost there is, if any, and any other important details. 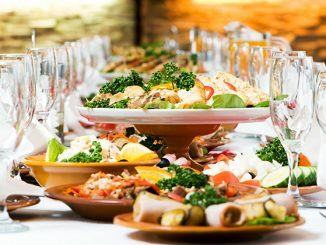 Getting Help: Determine how much help you will need for the holiday party. Will you ask friends, family or co-workers to volunteer or what help will a catering service provide. For how long? Do you need a bartender? Valet parking attendants? A DJ? Who will help keep the food restocked? The drinks refilled? Where do you put the trash? Where do put the recycle trash? Who’s going to clean up? A little planning ahead of time can make clean up much easier. Name Tags: Don’t forget the name tags! Spouses and significant others will appreciate your thoughtfulness. An Hour Before: Turn on your favorite holiday music, light the candles, set out the hors d’oeuveres and open the wine and the bar. 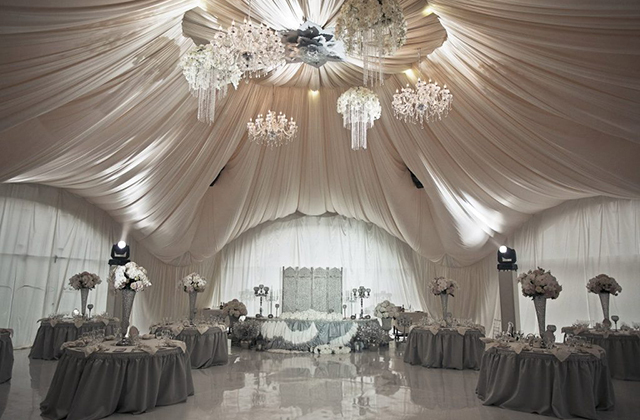 Take a quick look through the party area to make sure everything is in its place and double check your to-do-lists. With planning, you can have the time to enjoy your party and your guests! Jeanette Herren, owner of Announcingit.com, has been helping people celebrate life’s special occasions with custom printed party invitations for over 19 years. Announcingit has holiday party invitations, Christmas party invitations, holiday photo cards, adult birthday party invitations, children’s birthday party invitations, halloween party invitations, bridal shower invitations, baby shower invitations and more. Visit us at http://www.announcingit.com to see our line of exclusive invitations you won’t find elsewhere as well as invites from the leading manufacturers.